In 1921, with a Bachelor of Science in mining engineering, Earl D. Wallace, Sr. began his professional career as engineer and geologist for petroleum exploration at Petroleum Exploration, Inc., in Lee County, Kentucky. In 1942 he became a vice president and director of The Standard Oil Company ( Ohio) headquartered in Cleveland. 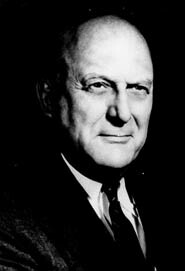 He was president of the Sohio Petroleum Company, a Standard subsidiary, when he left in 1953 to become an Associate of the Wall Street investment banking firm of Dillon, Read, and Company, where he was in charge of private investment in oil and gas properties until his retirement in 1965. During this phase of his life, Earl Wallace applied his education from the College of Engineering, along with his innate abilities and hard work, to rise to the top of his profession. Mr. Wallace spent the last 29 years of his life in volunteer work. His most notable efforts were in the restoration and preservation of Shakertown of Pleasant Hill, Kentucky. Shakertown is an independent organization that affords all of us a glimpse into the 19th century way of life of the Shakers. Mr. Wallace’s efforts ensured that Kentucky and the nation were more aware of their history and their roots, and he left this state a better place than he had found it. A 1982 article in the Lexington Herald newspaper described Wallace as a “hard-driving businessman who also has a sharp sense of humor and a genuine feeling for others.” Mr. Wallace’s preservation efforts are an example of his concern for others and these efforts have ensured that each one of us know of the Shaker gifts of simplicity and freedom. He received Honorary Doctor of Laws degrees from Transylvania University, the University of Kentucky and Centre College of Kentucky. In 1963 he received the Kentuckian of the Year Award from the Kentucky Press Association. In 1982 he was presented the Governor’s Medallion, the highest award the State can give to one of its own. In 1985 he was given the John Wesley Hunt Award from the Bluegrass Trust for Historic Preservation. Mr. Wallace was inducted into the College of Engineering Hall of Distinction in 1992. He is survived by a son, Earl Jr.; a daughter, Betty Tenney; a step-daughter, Jane Michler; and several grandchildren.